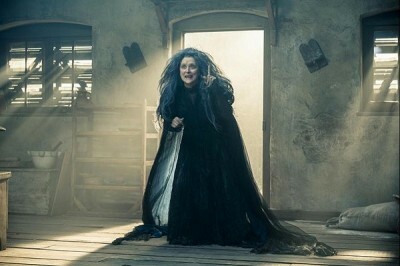 Hollywood takes its semi-annual stab at reviving the movie musical with the latest from Rob Marshall (Chicago), an adaptation of Into the Woods, Stephen Sondheim's much-beloved grown-up take on fairy tales. All the gang is here: Jack and his beanstalk, Cinderella, Little Red Riding Hood. In Sondheim and James Lapine's version, these Grimm stories intersect, taking place in one kingdom, the ups and downs of each affecting the lives of others, all in service to the theme that sometimes wishes aren't exactly all they are cracked up to be. "Happily ever after" is not an infinite experience. Tying all the folklore together are a single couple, a baker (James Corden) and his wife (Emily Blunt), a kindly pair who are shocked to find out that their inability to conceive a child is due to a decades-old curse incurred by the baker's father (Simon Russell Beale). The old man attracted the wrath of their witchly neighbor (Meryl Streep) when he robbed her garden of its magic beans and other greenery to satisfy the craving of his pregnant wife. As payment, the witch took their unborn daughter, Rapunzel (Mackenzie Mauzy), and for good measure put a magical stop to their family line. You see, the theft of the beans in particular stripped the witch of her eternal youth and turned her into a clichéd crone. All of this can be reversed if the hopeful couple can gather four ingredients in the next three days: a white cow, a golden slipper, blonde hair, and a red cape. See how this all lines up? So, for the next hour or so, characters criss-cross and connive and kvetch, all the while singing memorable songs and seeking to buck fate. Cinderella (Anna Kendrick) is unsure of her love for the shallow-witted prince (Chris Pine). 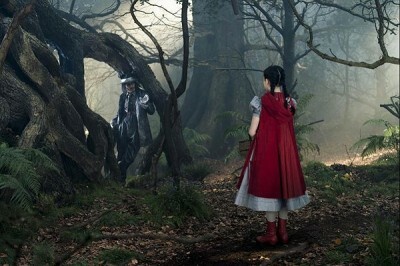 Red Riding Hood (Lilla Crawford, one of Broadway's recent Annies) avoids a pimp-daddy wolf (Johnny Depp, whose appearance is mercifully brief). And Jack (Daniel Huttlestone from Les Miserables) brings danger to the kingdom with his antics up the beanstalk. Many of the more familiar aspects of the different fairy tales happen off-screen. For instance, we never follow Cinderella into the ball. Nor do we see Jack pulling his tricks around the giant's palace. 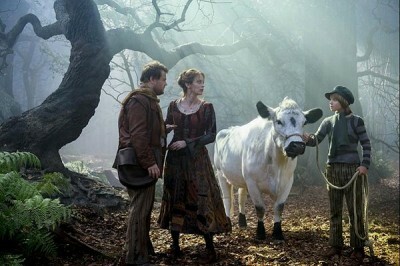 Into the Woods is about the in-between moments, the yearnings and the mistakes that both help and hinder one on their path, and the comedown when we find what we want is not exactly perfect. Marshall, working with a script from Lapine, is using a lot of shorthand to cram a bunch of story into what still feels like a bit of a bloated production. It's light and airy to watch, but still somehow too much. Soulless and frenzied, and yet still kind of effortlessly entertaining. Highlights of the production are easy to point out. Meryl Streep is having a blast as the evil influence that starts everyone's undoing. Yet she manages to smoothly inject some pathos into the performance, lending weight to the hurt and fear that motivates some of her decisions. Emily Blunt and Anna Kendrick are also very fun to watch, which is no surprise, they usually are; likewise, Cinderella's stepsisters (Lucy Punch and Tammy Blanchard) are delicious in their comic wickedness. But it's Chris Pine that turns out to be the biggest surprise. As Prince Charming, he has finally found the perfect vessel for indulging all of the blustery William Shatner mannerisms that he has to avoid in Star Trek, and the results are hysterical. His song of romantic anguish, performed with his little brother (Billy Magnussen), the prince in love with Rapunzel, is the cinematic Into the Woods' true showstopper. The deflation of the stereotypical Disney prince is fantastic. The rest is...well, just fine. I didn't particularly hate anything outright, nor did my mind necessarily wander too far. The second half of the movie drags as the characters try to figure out how to handle the threat of the giant's angry wife, especially since plot points get rehashed as exposition for the benefit of different characters as they rejoin the group. The heavier aspects of the story also get short shrift. Characters die and transgressions occur that are brushed off with such nonchalance, it somewhat undermines the idea that this is the darker flipside of the accepted sanitized cartoon narratives. I mean, I know it's a musical and all, but that doesn't mean Into the Woods has to be so lacking in genuine emotion. Luckily, the music is irresistible, and the editing by Wyatt Smith (One Direction: This Is Us) is lithe and assured, keeping Into the Woods bopping along for the better part of its running time. Rob Marshall doesn't quite recapture his Chicago magic, but he has at least begun to redeem himself for Nine. Though I am sure there are some thinkpieces lurking across the internet, haunting a few editors' inboxes, and wondering if the musical genre can ever finally make the comeback it deserves, it doesn't really feel like all that much is riding on Into the Woods. It's good enough as a one-time thing, nothing more than that. Order "Into the Woods" now!